HURRICANE LANE HAS drenched Hawaii ahead of its arrival in the island state, prompting US President Donald Trump to declare a state of emergency as landslides and flash flooding left roads blocked. The National Weather Service said Lane – located about 320 kilometres south of Hawaii – remained a powerful hurricane, packing winds in excess of 209 kilometres per hour, although it was downgraded to category three mid-afternoon local time. The eye was expected to sweep very close to or over the islands, 3,218 kilometres southwest of the mainland US, sometime later last night. Up to 12 inches of rain had already fallen before dawn, according to federal authorities, with 30 inches expected in the worst-hit areas over the coming four to five days. “Someone once told me it wasn’t raining when Noah built the Ark,” American Red Cross vice-president Brad Kieserman told a news conference in Washington. Emergency teams have set up 16 evacuation centres, with a further 19 due to open throughout the day, authorities said, as Trump urged Hawaiians to hunker down and prepare for the worst. “Our teams are closely coordinating with the state and local authorities. You are in our thoughts!” Trump tweeted. “Last couple of days it’s been like this – it’s been busy,” said Chris, an employee at a gas station in Haleiwa, on the north shore of Oahu island – the location of the capital Honolulu. Sea levels were expected to rise as much as two to four feet above normal tide levels, causing coastal erosion and prompting a storm surge and “large and destructive waves”. Surfers were observed taking advantage of the calm before the storm to get out on their boards one last time on Wednesday before the ocean got too violent. United Airlines announced it had cancelled all of its flights today to and from Kahului International Airport on Maui, the second-largest island. Honolulu authorities said they were planning to activate a three-minute island-wide outdoor siren warning system at 4pm (2am Irish time) to alert the public to the possibility of severe flooding. Free transport will be available between the capital and Oahu island’s evacuation shelters, which had welcomed around 350 people by noon, according to the Maui 24/7 local news portal. The US Coast Guard said 57,000 US military personnel already stationed in Hawaii stood ready to launch search and rescue missions and provide logistics and medical support. “Hurricane Lane is not a well-behaved hurricane,” Governor David Ige said in a statement as he declared a state of emergency on Tuesday on Big Island. 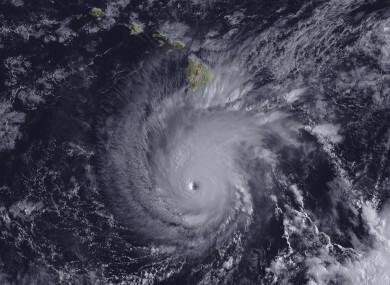 Hurricanes rarely make landfall in Hawaii and the last major storm to strike the state was nearly three decades ago, when Hurricane Iniki barreled into the island of Kauai, leaving six people dead and causing billions of dollars in damage. Hurricane-related deaths in Puerto Rico have been estimated at as many as 4,600 people, largely because prolonged and widespread power outages and washed out roads prevented access to health care, according to US researchers. Email “Trump declares state of emergency as Hawaii braces for hurricane”. Feedback on “Trump declares state of emergency as Hawaii braces for hurricane”.